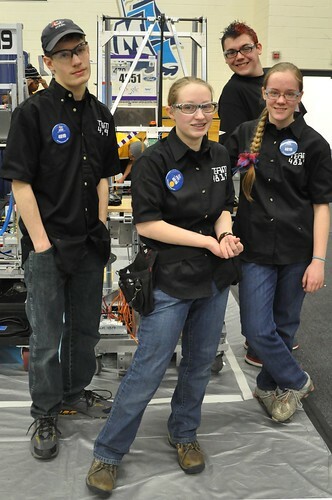 Presenting the 2015 Drive Team of our Flat Mountain Mechanics. 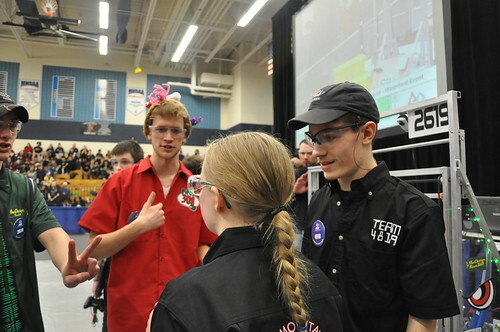 While preparing for our first matches, Rebecca entertained some judges with her stories about building the robot! 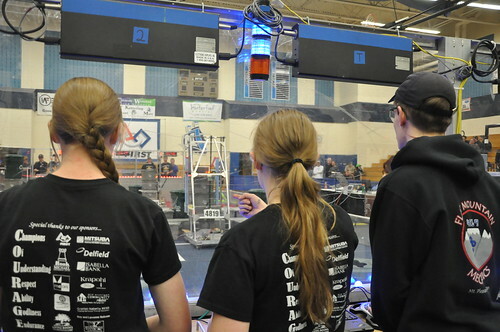 Pointing out unique features of our bot. 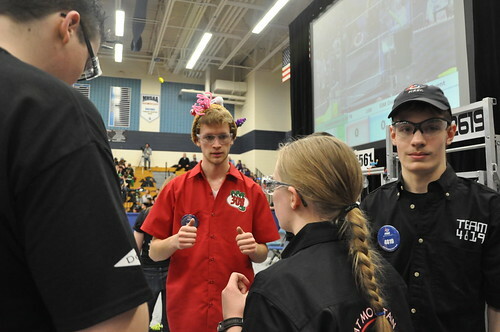 As Drive Coach, Rebecca was responsible for negotiating strategy with our alliance partners. 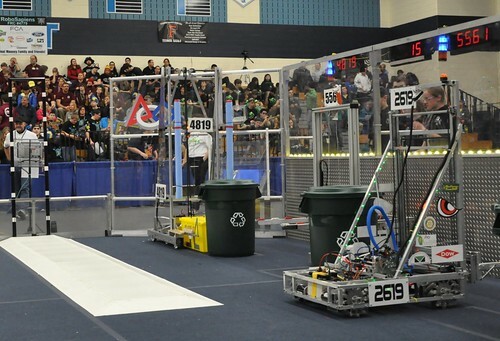 Our friends from The Charge in Midland were alliance partners for this match. 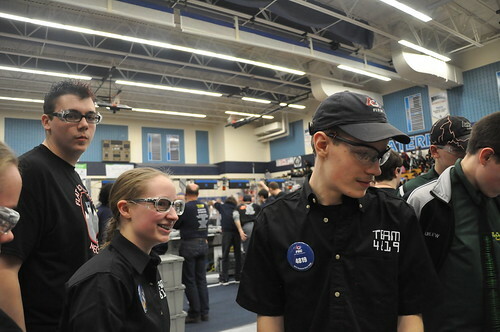 Back in the pits, Christian explained the complex robot controls to another set of judges. 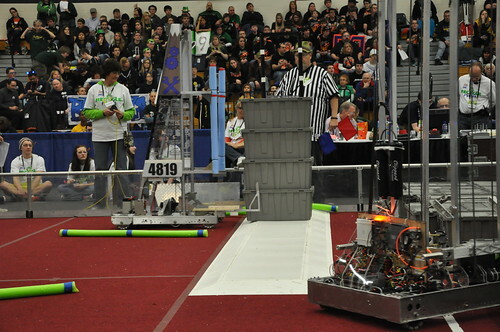 This was our highest-scoring match. 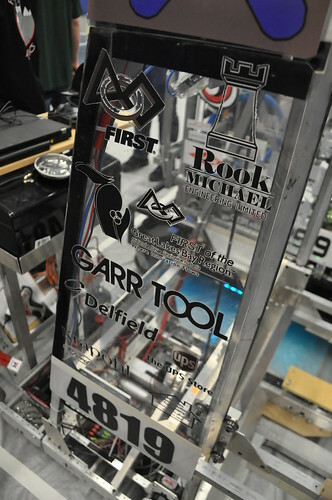 For awhile on the first day of competition, our team was in 2nd place! 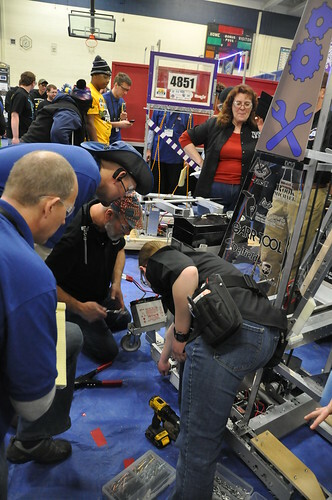 Tweaks and repairs in the pits at our first competition in Waterford (a bit NW of Detroit). 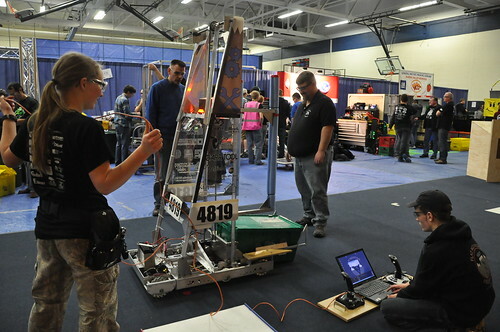 These first 2 pics were captured and kindly shared by Daniel Ernst, talented event photographer for FIRST of Michigan. 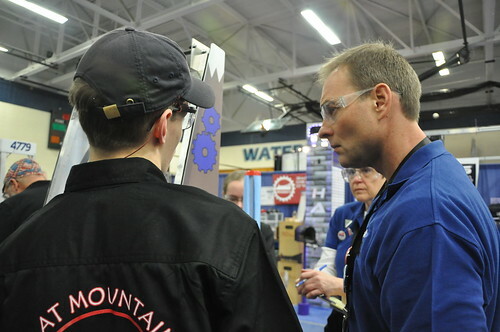 The man in the white shirt is in fact Daniel Ernst! 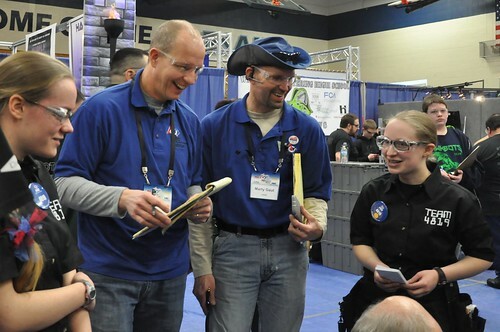 I finally had a chance to thank him for both his terrific photography and his generosity in freely sharing it with the public. 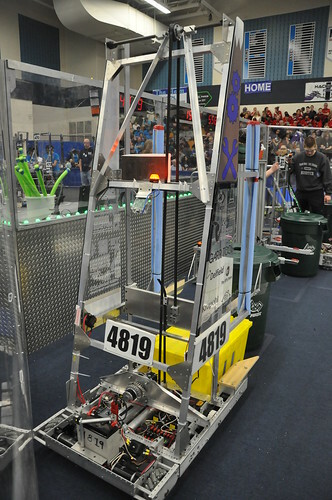 and finally, our first opportunity to practice on the regulation field. 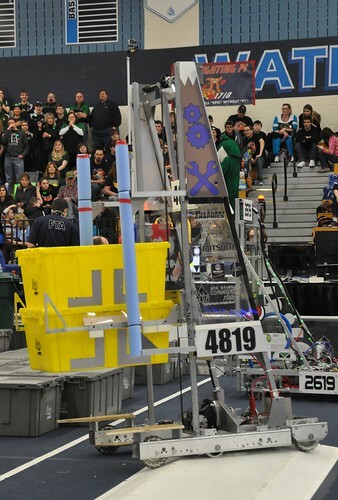 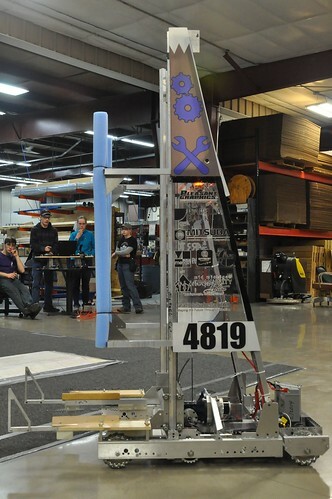 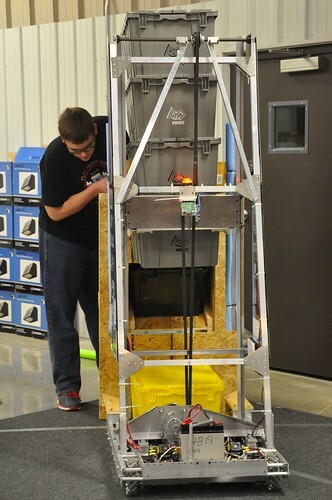 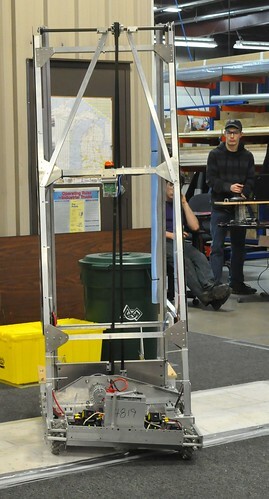 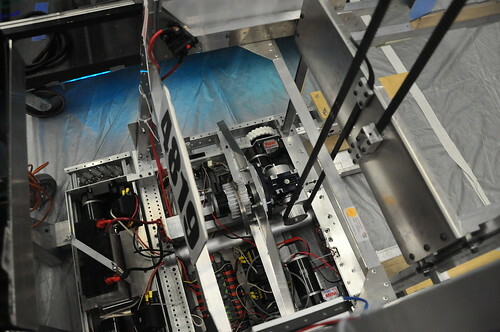 The height of this year’s robot required a custom-built cart. 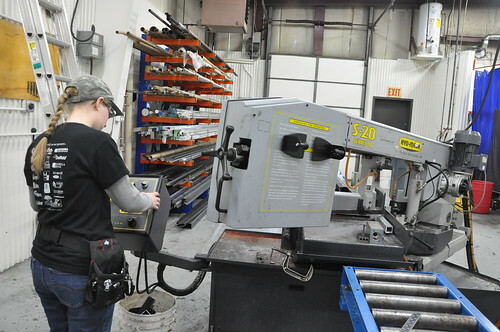 Rebecca sketched out some ideas that our lead mentor (unpictured) refined. 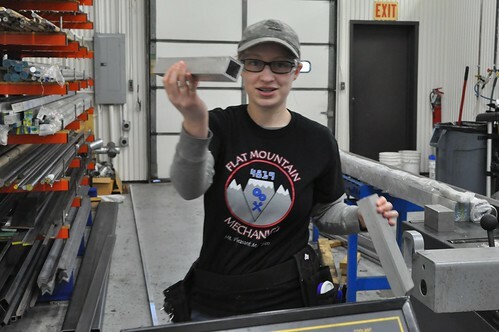 Then, these great mentors worked with Rebecca and a few other students to fabricate and build it. 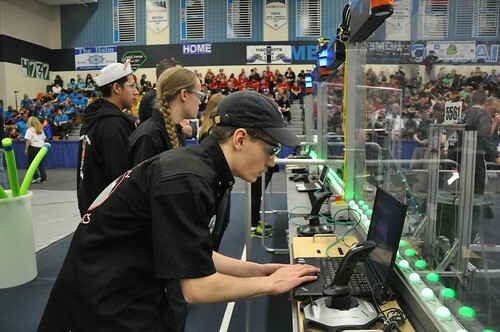 Here in Michigan, FRC teams are allowed 6 hours of heavily regulated “unbag time” between the “stop-build day” and each district competition. 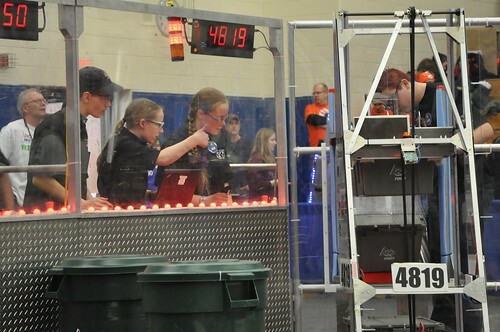 Rebecca and a fellow student unpacked the robot for one of those approved work sessions. 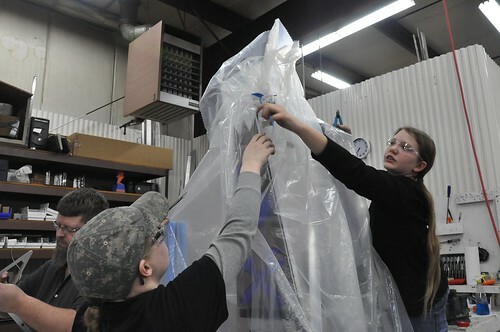 Christian and his friend added some final touches. 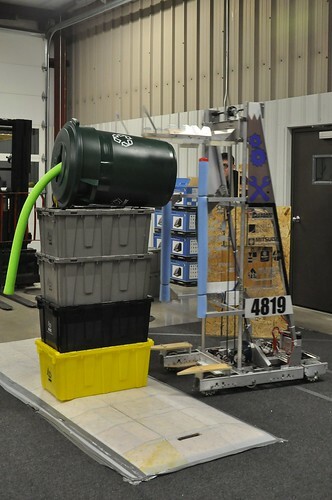 After some minor improvements, our finished Recycle Rush robot was ready for driving practice. 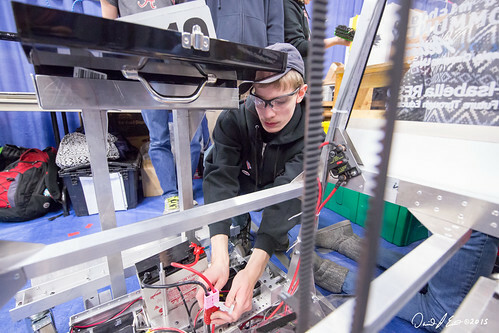 Christian was selected to control the 1st joystick. 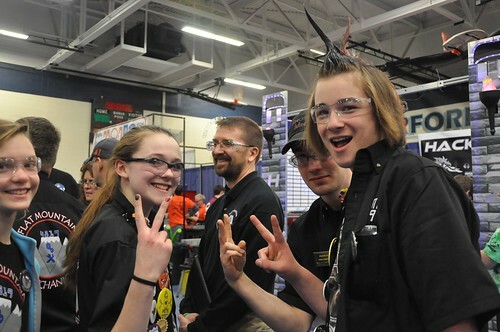 Teammate J controlled joystick 2, and Rebecca was appointed as the Drive Coach for this year’s competitions. 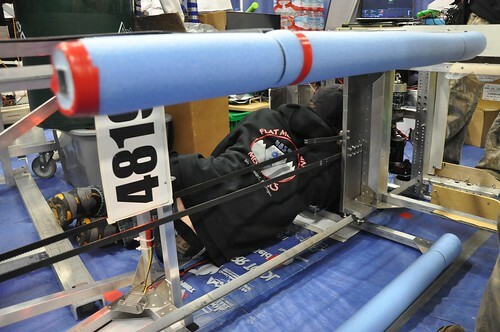 Note the articulated chassis our team worked so hard to design, fabricate, and assemble! 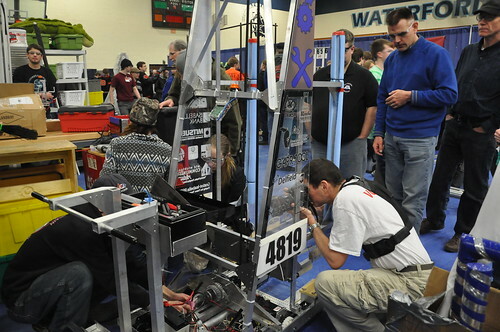 Terry was the mentor in charge of the chassis component. 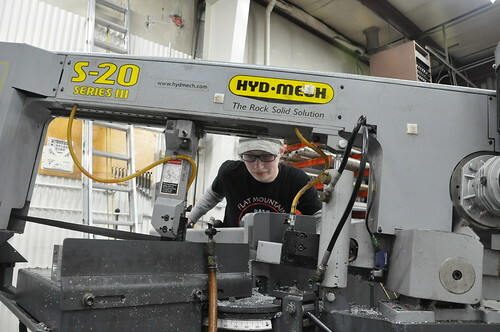 He and Rebecca and teammate J poured hours upon hours into it over the course of the 6-week build season. 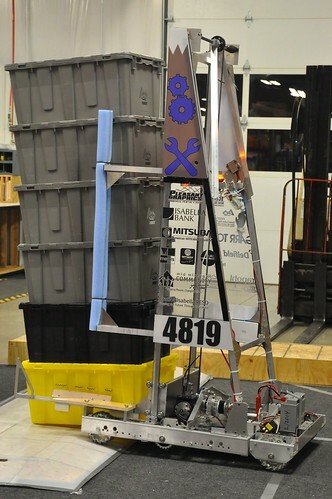 Our human player practiced loading totes into the robot through the tote chute. 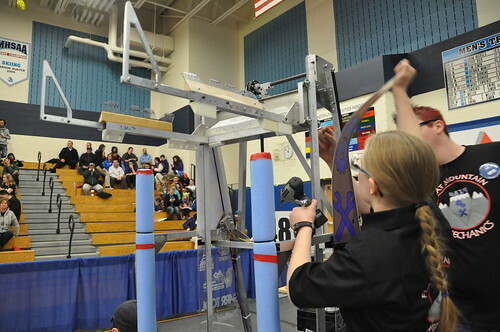 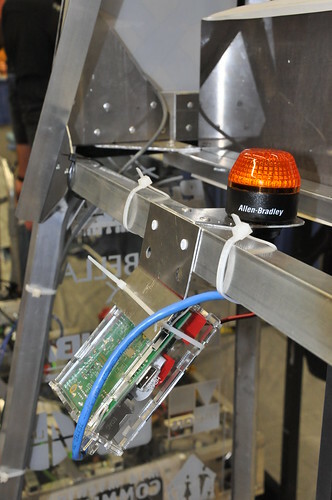 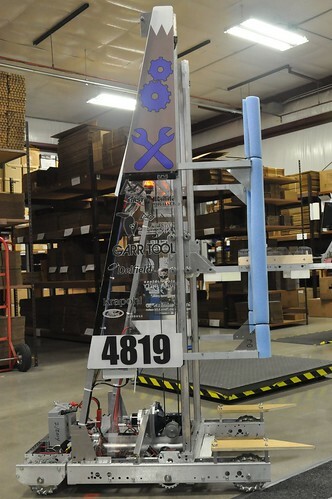 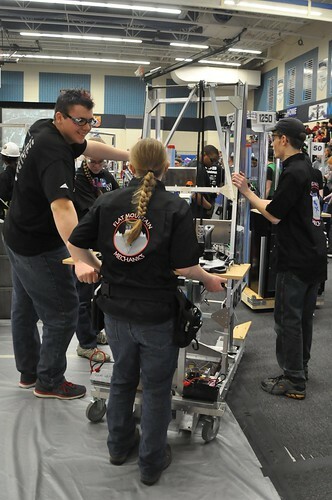 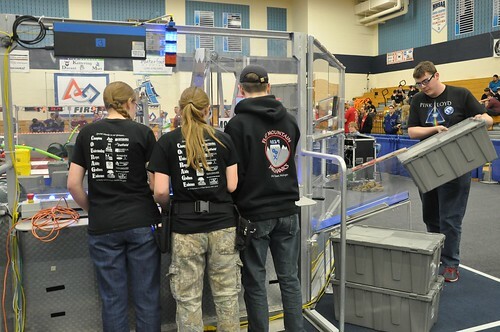 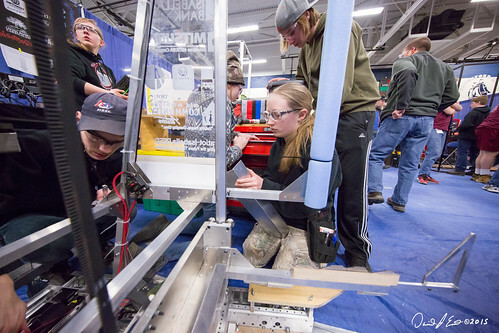 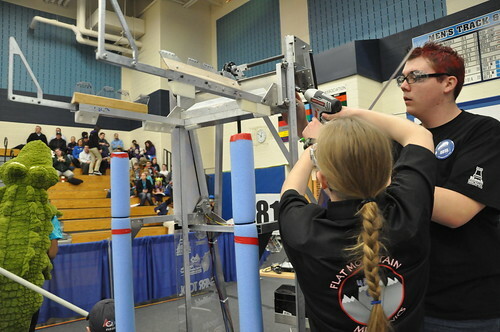 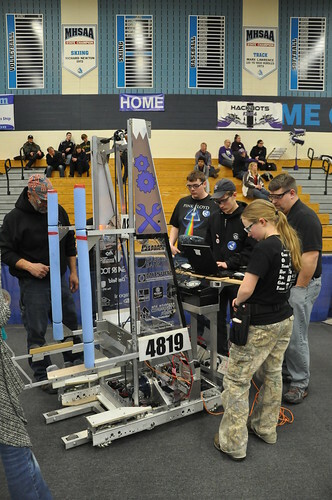 Just a few days until competition—our drive team practiced until unbag time expired!